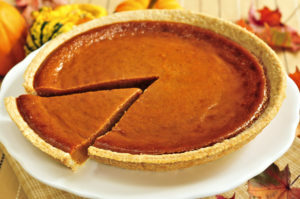 What Are The 9 Health Benefits of Pumpkin Pie? The key element of the pumpkin pie is obvious but still needs to be stated. It’s pumpkins. Pumpkins are native to North America and usually associated with late fall and winter because of its growing cycle. Because it contains seeds it’s scientifically a fruit but it’s nutritional makeup makes it similar to vegetables. Now the vitamin A is in the form of beta-carotene. This is important because you can avoid vitamin A toxicity this way since beta-carotene is converted to vitamin A as your body needs it. As I’ve shared in previous posts antioxidants protect your cells from oxidative stress caused by free radicals. Pumpkins contain a rich source of powerful antioxidants like alpha-carotene, beta-carotene, and beta-cryptoxanthin. In animal studies these antioxidants have been shown to protect the skin against sun damage while lowering the risk for cancer and eye diseases. The key here is the health benefits of vitamin A. As stated earlier, pumpkin is an extremely rich source of beta-carotene, which the body can convert to vitamin A as it needs it. Vitamin A can strengthen your immune system to help fight infections. And pumpkin is a great source of vitamin C, which helps to increase white blood cell production. Pumpkin contains Lutein and Zeaxanthin in addition to the health benefits of vitamin A in protecting vision. Vitamin A helps your retina absorb and process light. Lutein and zeaxanthin are powerful antioxidants that help prevent cataracts. And may slow the development of macular degeneration. Pumpkin is classified as a “nutritionally dense food.” This means that it’s packed with a high level of nutrients compared to its calories. One cup of pumpkin is under 50 calories and consists of 94% water. This helps to suppress your appetite while hydrating your body. And with 3 grams of fiber this makes it a better carbohydrate source than rice and potatoes, which less impact on blood sugar. Fiber also slows digestion which keeps you feeling full longer. There are numerous studies that show the power of carotenoids to lower the risk for stomach, throat, pancreas, prostate, lung, and breast cancers. And pumpkins are a rich source of carotenoids. Pumpkin is high in potassium. In any muscle contraction sodium is needed for the contraction and potassium is needed for relaxation. This means that having a rich source of potassium in your diet helps to maintain a proper heart beat. Plus there are studies that show people with higher potassium intake have lower blood pressure and a reduced risk for strokes. And because pumpkin is high in antioxidants it helps to protect you against oxidized LDL cholesterol, which causes vascular inflammation that can lead to plaque formation. Again we come back to the high level of beta-carotene in pumpkins, which then turn into vitamin A. This vitamin A is then transported to your skin to help protect you from the damage caused by harmful UV rays. And the vitamin C is pumpkin helps your body make collagen, which is necessary for healthy and vibrant skin. Plus the lutein and zeaxanthins that help protect your eyes also helps to boost your skins ability to protect itself of harmful UV rays. Because pumpkin is a nutritionally dense food with a good source of natural fiber it helps to reduce blood glucose levels. And several studies have shown pumpkin to improve glucose tolerance and increase the amount of insulin produced. As you can see the health benefits of pumpkin are numerous. And the one recipe that is common for most people is pumpkin pie. Which if you like deserts after your meals is always a great desert option. As you can see the health benefits of pumpkin pie and all ways to prepare pumpkin can add a rich sources of beneficial nutrients to your diet.